This week, we began installing our smart batteries on the Isles of Scilly in the first stage of a landmark programme that aims to transform the lives of islanders and provide a model for smart grids across the globe. 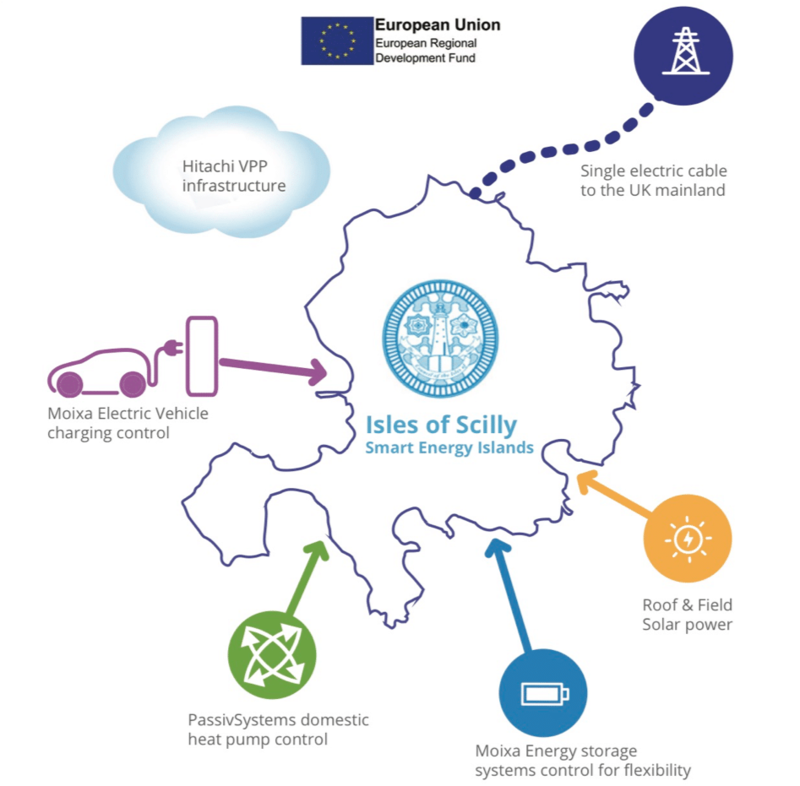 The £10.8 million Smart Island project will demonstrate how solar power, batteries, smart heating technologies and electric vehicles (EVs) can work together to support the islands’ energy system, alleviate fuel poverty and reduce toxic carbon emissions. We’re installing a total of 43.8kWh of smart batteries in homes across the Islands. Ten smart homes will trial a range of low-carbon technologies, including air source heat pumps and smart water heaters supplied by PassivSystems. Working with PassivSystems and using our experience in artificial intelligence and battery aggregation, we’ve developed smart control systems to manage and optimise the batteries, heat pumps and water heaters, to learn their behaviour and maximise savings. The aim is for the Isles to source 40% of its energy from renewables by 2025. Beyond demonstrating the value of our smart batteries, we’re also paving the way for the islands’ EV ambitions, using an electric van and charging point to pilot a vehicle-to-grid (V2G) system. Our algorithms will ensure that the vehicle’s battery is always charged and ready to jump into action if needed by council’s water department. But when it’s not being used, it can support the grid, cut bills and enable more renewables. Technology like this will be key in helping the project achieve its goal of seeing 40% of vehicles on the island being electric or low-carbon by 2025. The programme is designed to transform the lives of the 2,200 islanders. The Isles of Scilly currently rely heavily on imported fossil fuels and electricity. High fuel costs and large numbers of homes with inefficient heating systems leave 15.5% of households fuel poor, one of the UK’s highest rates. That’s why all of the low-carbon infrastructure will be owned by a non-profit Community Interest Company, which will sell power generated by the solar panels and recycle the income to reduce electricity bills by 40% by 2025 for all islanders through a special tariff. The installations have only just begun so watch this space and stay tuned via Twitter, LinkedIn and Facebook for regular updates.